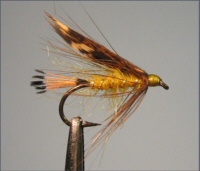 The flies used in Scottish sea trout fishing are many and varied. 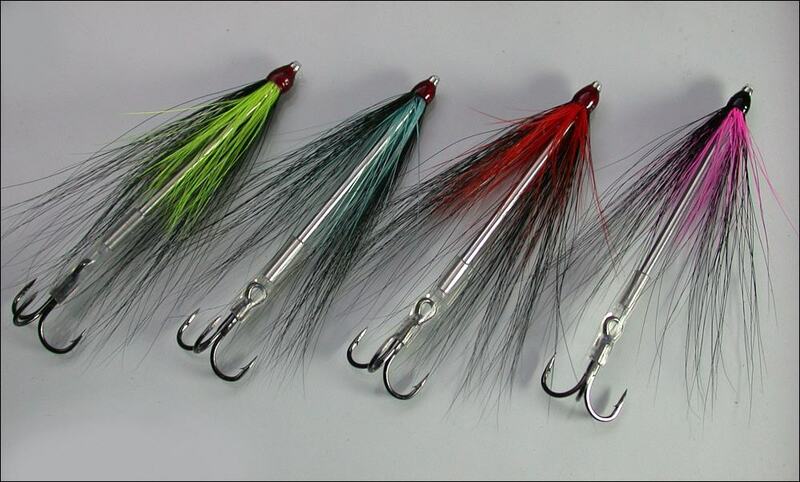 Trout flies, like the Peter Ross, Butcher, Mallard and Claret and Teal Blue and Silver, are popular on the loch but in a larger size, perhaps a size 8 or 10. 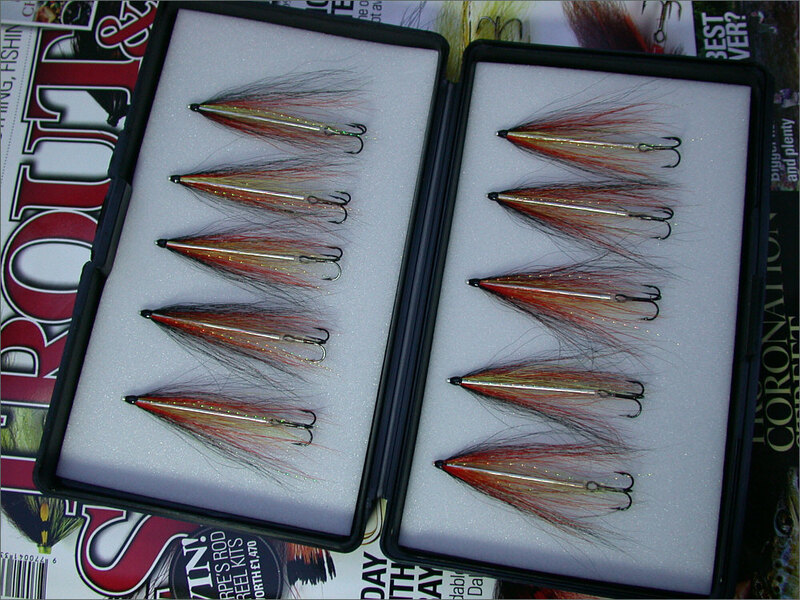 These same sea trout flies will often be used at night on the river along with modern favourites like the Silver Stoat and the Medicine. 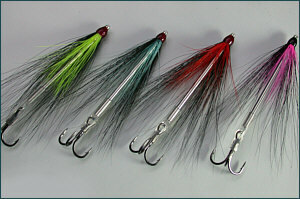 Later in the night, larger lures tied on tubes, Waddington shanks or needles may be used. 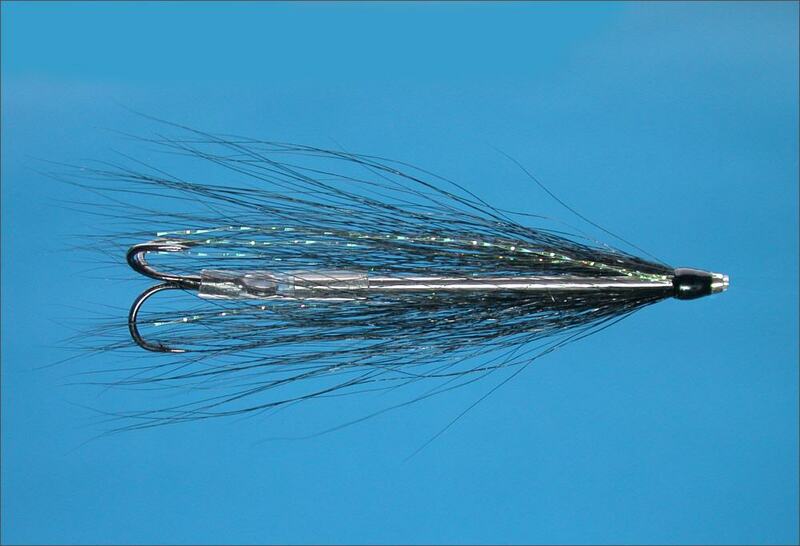 In addition to some modern sea trout flies, such as the needle tube fly shown below. 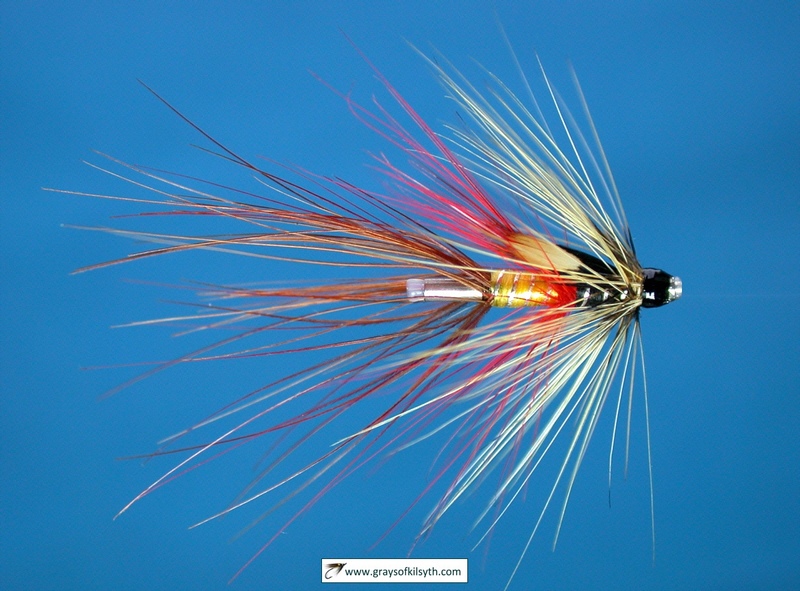 Gray's Needle Tubes were developed primarily with sea trout in mind, although they have proven very effective dressed as salmon and steelhead flies also. 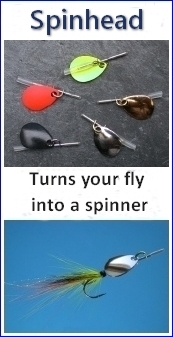 Available in lengths from 10 to 40 mm, with an outside diameter of only 1.5 mm, they are the slimmest commercially available lined metal fly tying tubes ever made. They fish more deeply than traditional plastic or aluminium tubes but are more easily cast than the heavy copper and brass tubes. 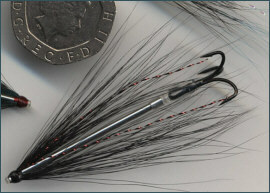 Needle tubes are now available for the fly tyer online at Grays of Kilsyth. 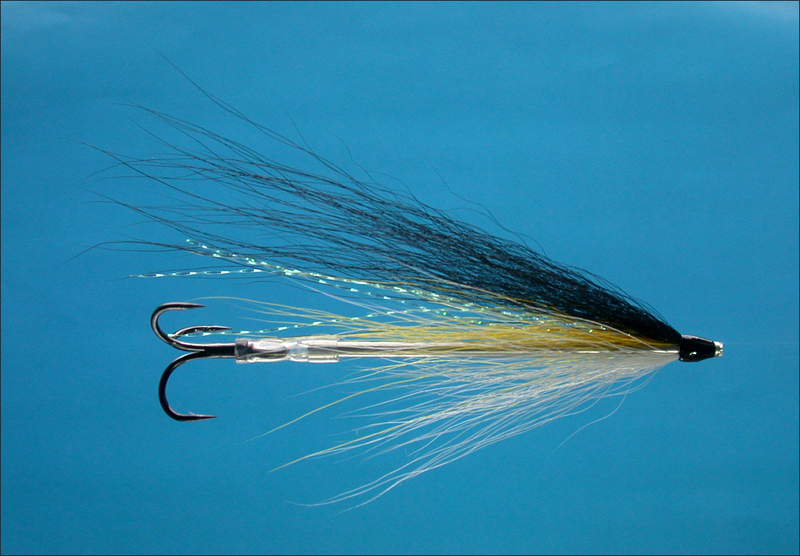 Also available for online purchase is a boxed selection of sea trout needle tube flies. 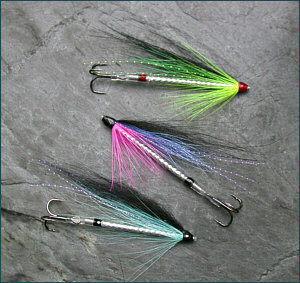 Some more examples of tube flies dressed on Gray's Needle Tubes are shown below. 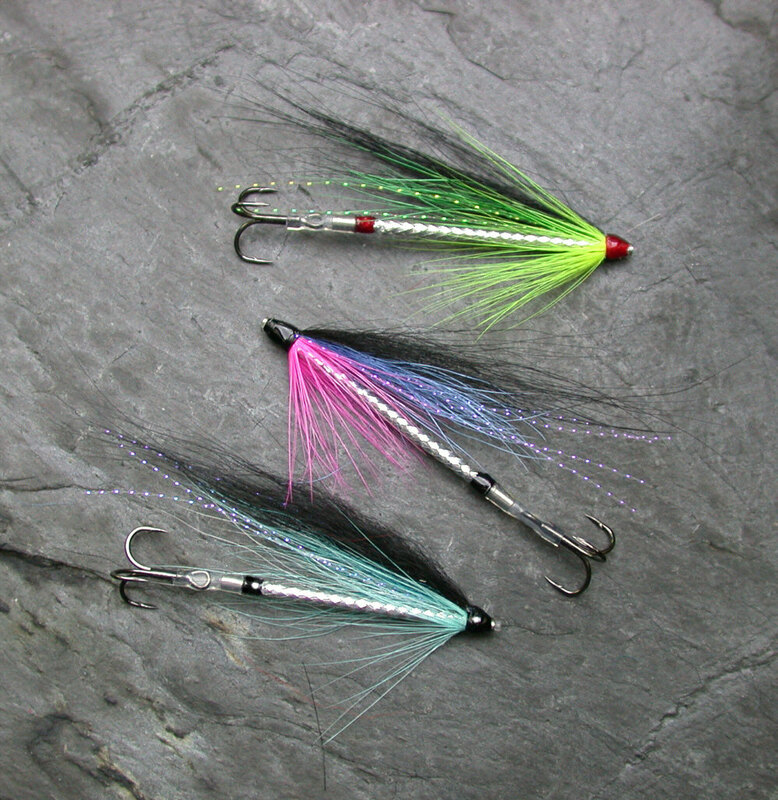 Illustrated below is a selection of sea trout flies for day and night fishing on loch and river. 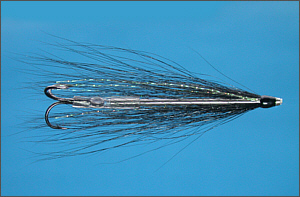 Each sea trout fly has established a reputation through many years of trials by day and night on the banks of our sea trout rivers. 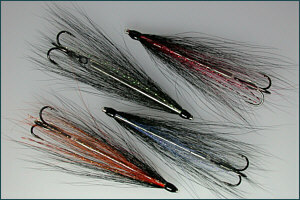 Each has earned its place in the history of sea trout fishing. 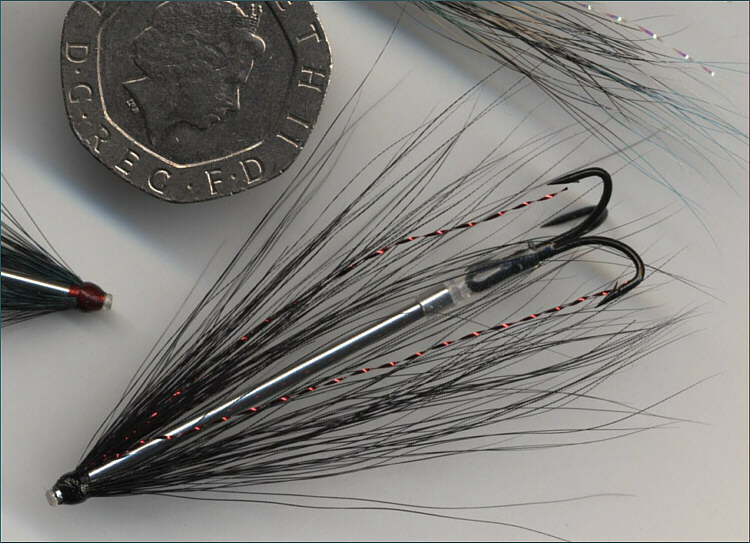 Derived from the Stoat's Tail salmon fly, this silver-bodied version has become one of the most popular of all sea trout night flies in use today throughout the British Isles. It is fished on floating and sinking lines. 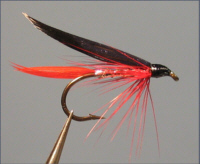 It can be tied on singles, doubles or trebles and as tube-flies, Waddingtons, snakes or needles. In the larger sizes, the hair from a squirrel's tail, dyed black, often replaces the hair of the stoat. 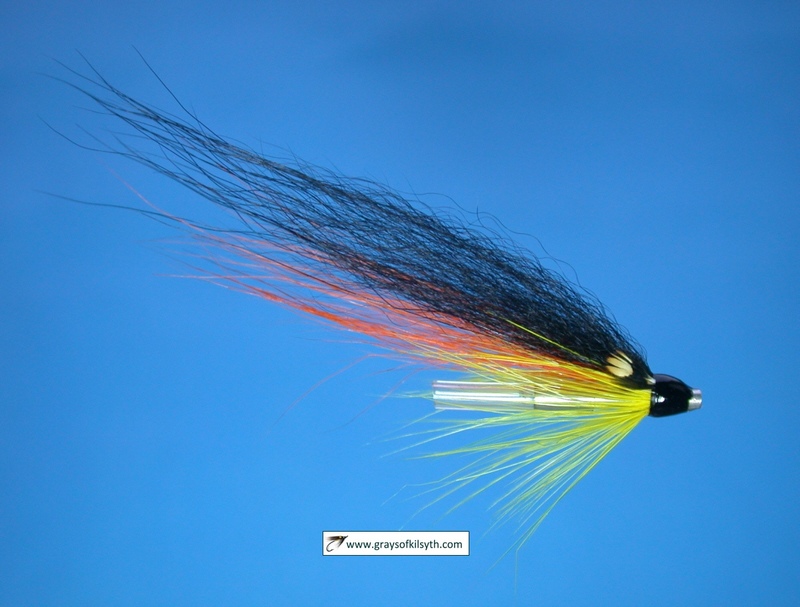 The plain black hackle may give way to brighter colours of red, orange, yellow or blue, each fisherman with his preferred variant. All are successful. 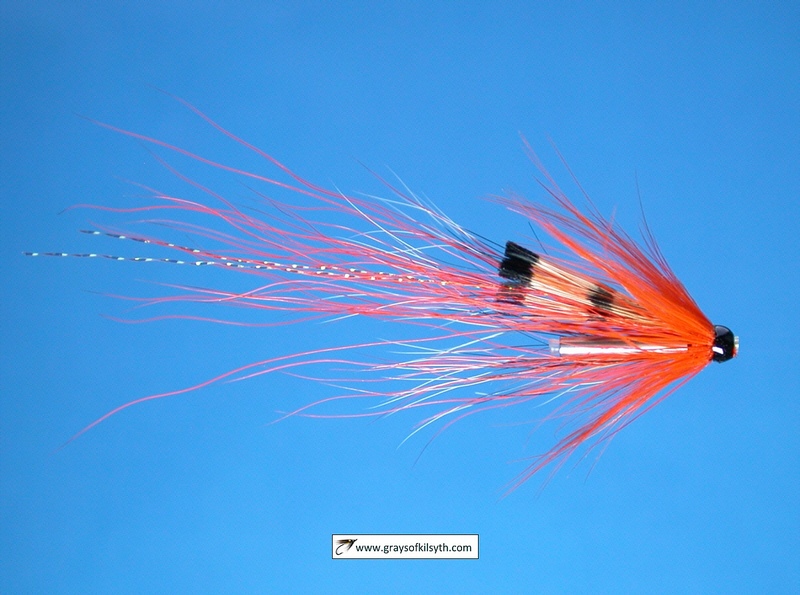 A truly great sea trout fly. 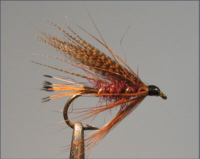 A good alternative to the Medicine when a slightly lighter tone of fly is desired. 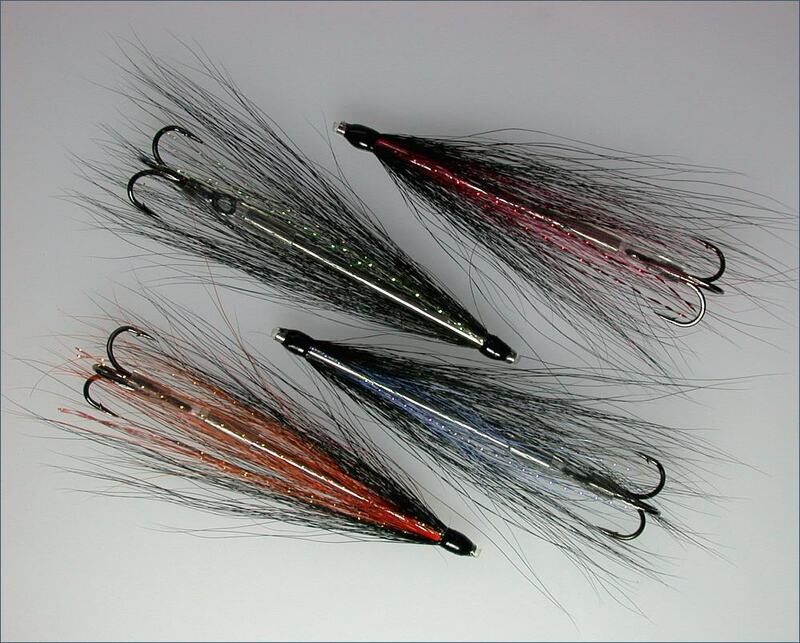 The hair from the tail of the grey squirrel, in its natural or dyed form, has successfully replaced the feather wing in many of our salmon and sea trout patterns. A commonly available material, its merit lies in its versatility and durability. The Butcher is said to have been invented by Messrs Jewhurst and Moon, of Tunbridge Wells, Kent in the early nineteenth century. 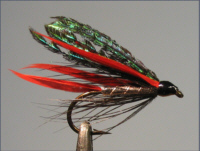 Together with its near relatives, the Bloody Butcher and the Kingfisher Butcher, it has been catching trout and sea trout ever since. 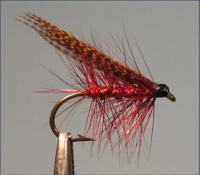 This pattern, with more red than the standard butcher, is considered indispensable by many sea trout fishers. It has become a sea trout classic. Introduced, under its old name, "Lady of the Lake", around 1860, it was later re-named in honour of Princess Alexandra. Some doubt remains over its creator. Some say W.G. Turle of Newton Stacey, Stockbridge. 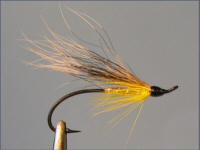 Others, that it was devised by Dr John Brunton, a well-known member of the Gresham Fishing Society and inventor of Brunton's Fancy. So successful a fly was it that it is reputed to have been banned on some waters. 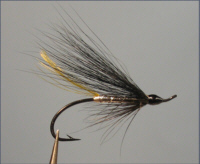 Still a favourite with many sea trout men. In his book "Sea Trout Fishing", 1929, R.C. 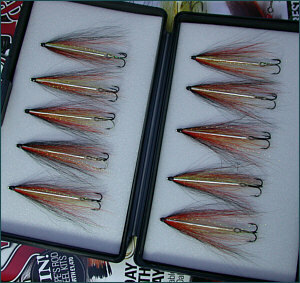 Bridgett, having gathered opinions from sea trout fishers the length and breadth of Scotland, compiled the following list of the ten most popular Scottish sea trout flies: Butcher, Peter Ross, Teal and Silver, Dunkeld, Mallard and Claret, Silver Doctor, Grouse and Claret, Pheasant and Yellow, Blae and Blue, Blae and Black. 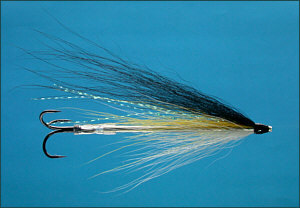 Even today, few sea trout fishers would feel deprived if restricted to these ten flies.